July 4th, the World Day for Captive Dolphins, is an opportunity for us to remember the plight of the thousands of whales, dolphins and porpoises held in captivity across the world. Travelling vast distances in the wild, in captivity, whales and dolphins suffer from restricted space and a limited social environment, often forced to perform circus-style acts to entertain the public. Dolphins and whales are highly organized marine mammals with their own language, which live in pods and have families. 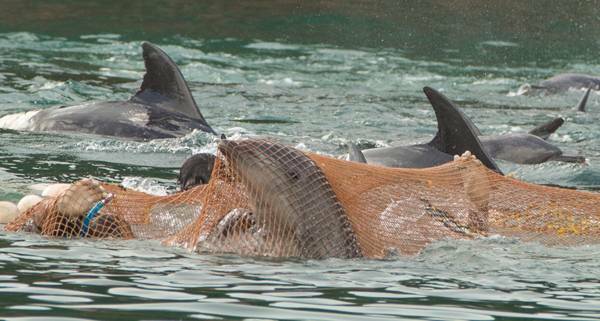 In poaching nets dolphins are killed, they hurt fins, feel shock, pneumonia develops because of water that comes to respiratory valve. On the land territory of Ukraine, only in 2009 there were opened 6 marine parks which do not satisfy the biological needs of dolphins. All of the three species of Ukrainian dolphins are listed in the Red Data Book of Ukraine. The fight for freeing captive dolphins is undertaken by the European Alliance to End Dolphins in Captivity which includes the Born Free Foundation, Whale and Dolphin Conservation Society, OceanCare, and others.